As red/cream amplifier, but price increased to 12 gns. As red/cream amplifier, but price increased to 16 gns. No longer the "New Standard" - maybe because the model wasn't new any more. 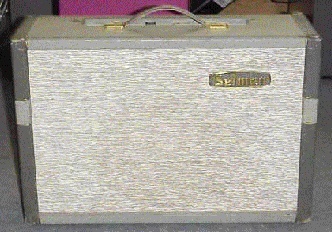 As red/cream amplifier, except the "TRUVOICE" logo along the top margin of the speaker cloth was dropped and replaced by a centrally-positioned gold Selmer logo, and later by a small "badge-type" Selmer logo. Price increased to 22 gns. As red/cream amplifier, except the "TRUVOICE" logo along the top margin of the speaker cloth was dropped and replaced by a centrally-positioned gold Selmer logo. Price increased to 30 gns. This model appears in later catalogues of the blue/grey era and the description suggests that it is a new model introduced during the time of the blue/grey coverings. A "3D Sound" is promised, doubtless due to the unusual configuration of 3 elliptical 10" x 6" speakers! Ten watt ouptput via ECC83 (4), EL84 (2) & EZ81 (1). Size 17.1/2" x 21" x 8.1/2". Single channel, two inputs, five controls, foot-switchable reverb and tremelo. Price 45 gns. As red/cream amplifier, except the following. "TRUVOICE" logo along the top margin of the speaker cloth was dropped and replaced by a centrally-positioned gold Selmer logo. Cabinet configuration changed to straight-sided (22" x 18.1/2" x 9"), no slanting rear-panel, control panel inset into top instead. Price increased to 53 gns. As red/cream Selector-Tone Rotary amplifier, except the following. "TRUVOICE" logo along the top margin of the speaker cloth was dropped and replaced by a centrally-positioned gold Selmer logo. Slight change in cabinet size to 23" x 19" x 10". Very slight changes to text on control panel. Price unchanged at 65 gns. It would appear that the Rotary Selectortone was discontinued halfway through the blue-grey period, and replaced by the Diplomat Reverb. This model appears in later catalogues of the blue/grey era and the description suggests that it is another new model introduced during the time of the blue/grey coverings. Rated at 15 watts via ECC83 (3), ECC81 (2), 6BR8 (1), ECC82 (1), EL84 (2) & EZ81 (1) through a 12" heavy-duty speaker. Size 19.3/4" x 22.1/2" x 9.1/2". Two channels, one with reverb and the other with reverb and tremolo, footswitchable. Four inputs, eight controls & Normal/Brilliant switch. Price 72 gns. As red/cream Selector-Tone Automatic amplifier, except in blue-grey. The "Truvoice" logo along the top margin of the speaker cloth was dropped and replaced initially by a centrally-positioned gold Selmer logo, and then by a small grey plastic Selmer badge at the top right hand corner of the speaker grill. Slight change in cabinet size to 24" x 20" x 11". Very slight changes to text on control panel. Price unchanged at 75 gns. The giant of Selmer's range in the early 60's, "with built-in tremolo AND reverb", and serious competition for the Vox AC30 which, at a similar price, didn't have the reverb feature of course. Output was 30 watts using EF86 (2), ECC83 (3), ECC81 (1), KT88 (2) & GZ34 into a pair of heavy-duty 12" speakers (probably Goodmans Audiom 70's). Size 29" x 20" x 10", control panel inset into the top and identical to the Selector-Tone Automatic but an extra rotary knob for reverb intensity replacing the pilot light. It had castors, so it's a heavy beast at 67lbs. A centrally-positioned gold Selmer script logo was fitted to the speaker grill initially, but later blue-grey models had a smaller grey plastic logo fixed in the top corner of the speaker cloth. Price charged was 105 gns, including footswitch and plastic cover. Selmer's first separate head and cabinet outfit, introduced during the blue-grey period in 1962. The head was a 30 watt twin channel (one normal, one bass) amp, fitted with 1 - GZ34, 2 - EL34, 4 - ECC83 valves. No reverb or tremolo; just simple volume, bass and treble controls for each channel. The cabinet contained two 12" Celestion speakers, and as well as being equipped with castors, also was fitted with brass struts to allow the cabinet to be angled back for improved sound distribution, just as fitted to some Fender amps. Heavy clamping devices were also fitted onto the top of the cabinet for securing the amp head. Price for the outfit was 115gns, but the head and cabinet could be purchased separately.